This work details current advances in assessing the characteristics of polymers, single fibres and fibrous systems, and associated processes based on evolving theories in the physical, chemical and mechanical sciences. It focuses on recent develpments in selected characterization methods - such as Fourier transform infrared spectroscopy, Fourier transform nuclear magnetic resonance, electron diffraction, x-ray diffraction and electron microscopy - applicatble to polymers, fibres and textiles. 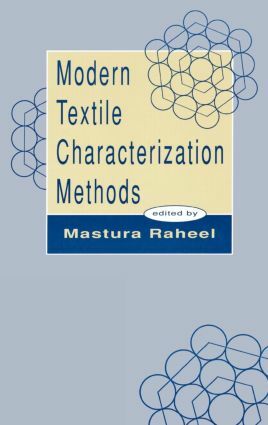 Introduction - developments in textile characterization methods; polymer characterization; surface characterization of textiles using SEM; investigation of textiles by analytical pyrolysis; liquid chromatographic technique in textile analysis; evaluation of DP finishes by chromatographic and spectroscopic methods; accessible internal volume determination in cotton; pore structure in fibrous networks as related to absorption; micromeasurement of the mechanical properties of single fibres; objective measurement of fabric hand; colorimetry for textile applications; assessment of chemical barrier properties; assessment of the protective properties of textiles against microorganisms.